What would one call this? Jell-o suspended in a condensed milk gelatin? It’s not really a pudding. Anyway, whilst reading the New York Times recipe, I came across this article and decided that I would attempt to recreate the concoction shown the in title photograph. Now, I loathe basically all Jell-o because I am not a fan of blatantly artificial flavouring, but I really like condensed milk, especially when it’s caramelised into dulce de leche. But that is fodder for another post. I figured that maybe putting the Jell-o in something I liked would make me enjoy it – this was faulty reasoning, as I keep picking the Jell-o out and only eating the condensed milk pudding part. I used cherry, blue raspberry, orange, pineapple and “melon fusion” because I wanted a rainbow of colours. Having tasted the product, I would recommend thinking about how the flavours will mix before preparing – the melon fusion, which was by far my least favourite, completely over powered all of the others with its fake watermelony flavour, and it also tainted the taste of the condensed milk portion. But, on a bright note, it does look pretty! 1. Prepare the Jell-o in separate containers according to the instructions on the package. Let set for 3+ hours in a refrigerator. 2. 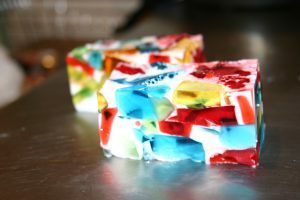 Remove the Jell-o from the refrigerator and slice into small cubes or other shapes. Gently place in a 9×13″ pan and toss to mix up the colours. 3. In a medium bowl, dissolve the plain gelatin packages in 1/2 c cold water. Once the gelatin “blooms” (it will look all bubbly on top), dissolve in 1 1/2 c boiling water, then stir in the condensed milk. Briefly let this mixture cool a bit (so that it does not melt the Jell-o shapes), and into the 9×13″ pan over the Jell-o shapes. At this point, you may want to smooth out the air bubbles on top for a cleaner look (I didn’t). Let set in the refrigerator overnight.